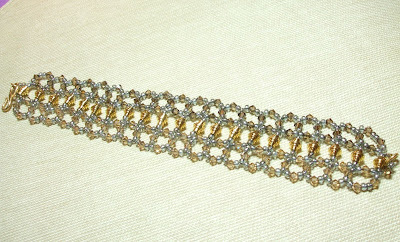 Yesterday I found a pattern online by Nancy Zellers and went to a bead store in Arlington to buy the right number of crystals and gold beads to make this bracelet. I started it at noon, and finished about four, so that didn't take so long! Practice makes perfect. This is definitely wearable, and I even impressed George! The moral of this story is: from little acorns mighty oaks do grow. 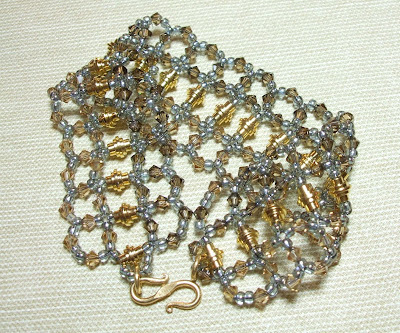 At the Bead and Button Show in early June, I rather impulsively signed up for a class called Rings and Bling, with a beautiful picture of a bracelet made with beaded rings. I show up for the class, taught by one of the great beaders, Jeannette Cook, and found out that I was in the right room, but the wrong class for me. Everyone was very nice, but I found out that Jeannette had sent an email to everyone who signed up for the class making sure that they were proficient at right angle weave before they showed up to try to make the project. Since I had signed up at the registration desk, I didn't have that information. I decided to stay and take the $140 (3 hour) class anyway, and Jeanette gave me kind and patient instructions on right angle weave beading. It was a little like showing up for a writing 101 class and find out it is being taught by James Joyce. Oh well. I have been struggling to learn this weave, and decided to jump in with cube beads and try to make something. I have the next project all lined up, with pattern and Swarovski crystals, but I needed to get the rhythm of this stitch first. Everyone says that most people have trouble learning right angle weave, and I think they are right. But at least I had a famous teacher to help me as I muddled through. Today I started and finished this practice bracelet. 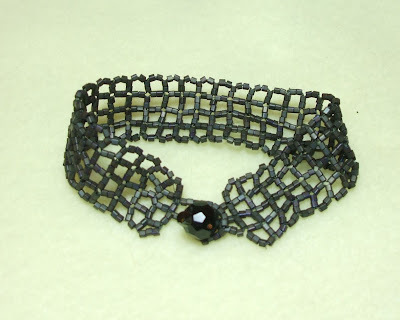 It is made with Soho cube beads in brown, closed with a black crystal. I don't know why I chose this particular shade, but I sort of like it. It looks like something Abby on NCIS would wear. So, this is my little acorn of a bracelet, with lots of beautiful projects in right angle weave to follow soon! 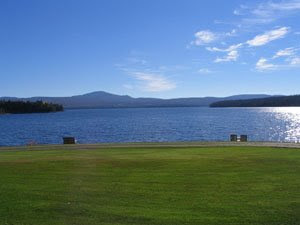 In two weeks George and I will be at our cabin in Northern New Hampshire. It is fun to think about. We have been going there for a week each summer for the last eight years. We take our fishing gear, a sweatshirt with a hood (it gets cool up there), our fold up chairs and lots of books. It is very peaceful and this year we have reserved a cabin that we have never had before, Otter Cabin. It is the small older cabin just a few yards from the water. At night you can hear the loons, and it was a high point of our visit two years ago when we saw a mother Merganzer and her 24 ducklings swim by. Loons come very close to us when we are fishing off the dock in the evenings. For $50 we can rent a boat and go out onto the big lake if we want. Sometimes we want, and sometimes we don't bother. The lake is 150 feet deep in places, and the fish are very far down, so I wouldn't say that our chances of catching anything out there are very good. One year we surprised everyone by bringing in a beautiful 19" lake trout. We love the fishing, and it is fun to concentrate on something entirely different than the stuff you think about every day. All we have to worry about is our line and whether our bait is still on the hook. It is fun to putter around and look at all there is to see. We have seen bald eagles, loons, moose, deer, rabbits, and all kinds of things. The birdwatching is good right around the cabin too, and George always has peanuts out on the cabin steps for the resident chipmunks. TV is spotty, there are no cell phone towers, and there is only one station on the radio, so we don't even bother with all that. Instead we play Cribbage and read and just enjoy nature. It is a very quiet place, and all the people who like to drink beer and party stay somewhere else. The evenings are perfectly quiet and if you want to "party" the only place to go is a local pizza pub that is pretty quiet too! It is good to be able to go this year and not worry about things at home. I'm really looking forward to long days in the sun with a good book, and some fun hikes and picnics. Canada is not far away, and some years we drive 30 miles into Quebec to St. Patrie to a favorite little restaurant where everyone speaks French. I'm really looking forward to our quiet and peaceful vacation! I got to stay home from work today. I had a project that needed to be finished, and I took a day off to accomplish that. It was a beautiful sunny day. Looking out my kitchen window this morning, I saw a very cute sight. We have three...count 'em, three baby woodchucks living under our garage. This is a disaster. A couple of years ago, we had a family of woodchucks with two babies, and I spent an unemployed summer looking at them and enjoying their antics in the warm sun. We thought we had gotten lucky and that our resident family of woodchucks had moved away. There was no real damage to the flower beds and vegetable garden last year. Of course, we didn't temp them with the stuff they really love to eat. Woodchucks love zinnias and lettuce and tomatoes and hate snapdragons, coleus and begonias. We have tried lots of remedies to get our resident woodchucks to move on. Our neighbors have reported that they have woodchucks in their garden. We were quietly convinced that it is not the neighbors who "have" woodchucks, but that our brood of woodchucks prefer to eat out. We will be going on vacation in two weeks. Our tempting little tomato budlings will be out there all by themselves, waiting for the voracious appetites of the three little pigs...er woodchucks. This is a disaster. But, boy, are they cute! We are quietly sitting in the den tonight and boom, we heard a noise. 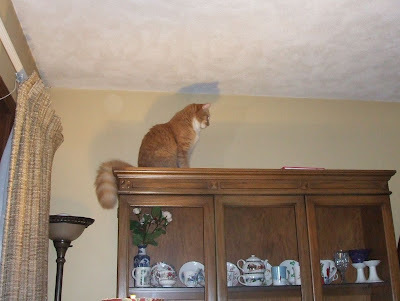 Simba the athlete cat had jumped from a table to the top of the china cabinet. He is 7 feet off the ground, and at the very least that is a four foot leap straight up. And I'm sure this wasn't the first time he had done this. We waited to see how he would get down. Quiet as a mouse, he jumped from the top to the medium level on his cat condo, another six feet or so across the room. Foosh. Down. No problem. Supercat! 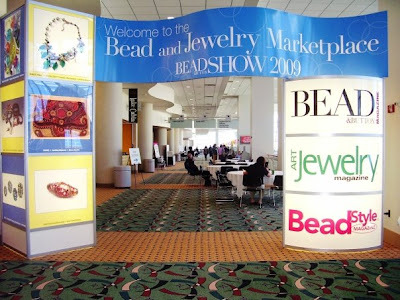 The Bead and Button Show ended on Sunday, and we flew home on Midwest. The flight was terrific and we were home on time and happy. I mention that because my flights to anywhere usually end up in tales of woe, but not this time! The Bead and Button Show was awesome as always. We had four days of wonderful classes, and fun shopping for beautiful new beads from artists and vendors who come from all over the world. This is my fourth year, and I was better able to handle the big hall this year, and got around to almost every booth. 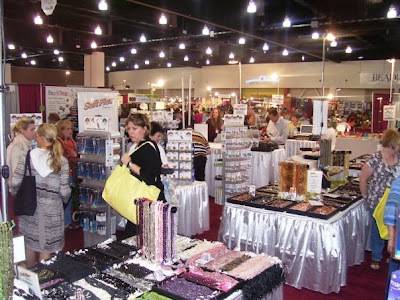 There are 450 vendors, so that is no easy task. It was great to see friends I hadn't seen in a year, and to buy a few beautiful lampwork beads from the artists who I know. I also found the silver prices irresistible and stocked up on some beautiful silver pieces. I bought Hill Tribe and Bali, and visited some sellers twice to get more. The silver wire which I need for wire-wrapping pendants and for making Viking Chain were half the price of anywhere else, and I had dreams about going back and buying more, so I did. 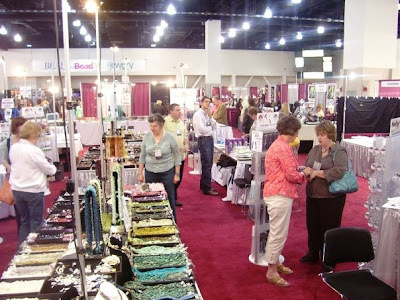 It is wonderful to be with thousands of other people who love making jewelry as much as I do. We always visit the tool and wire booths, and talk about our latest favorites and see the new products. I bought a cutter and a round nose pliers to die for. These tools are the Cadillacs of jewelry tools, and it takes a few years to afford them. But they are so fine and precise and the cutters cut like butter. Incredible. I have my work cut out for me to make more jewelry and get some pictures on the web and have a couple of jewelry shows. My creativity is unleashed and I have three new techniques under my belt; the right-angle weave stitch, silver metal clay and the double Viking Chain. Taking classes from the pros really makes you feel like a pro, and learning new techniques gives me confidence and the power to be even more creative. Time, time, I need more time!